Pep Guardiola insists he must continue to make progress with his players in order to see out the remaining three years of his renewed Manchester City contract. 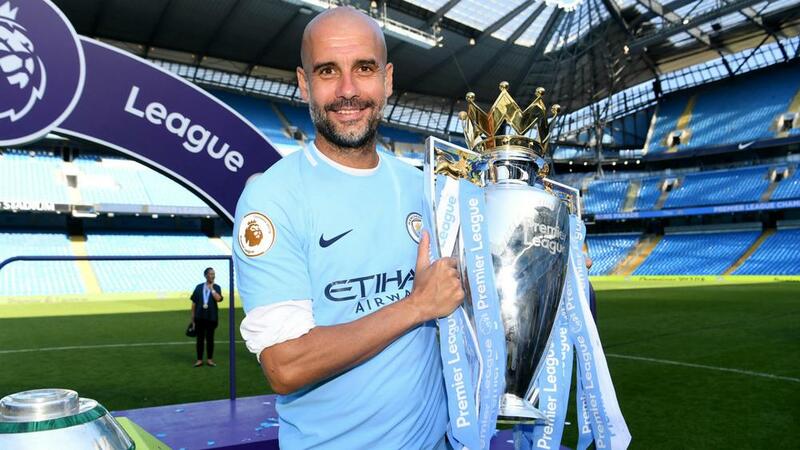 Guardiola has signed a two-year extension to keep him with the Premier League champions until the end of the 2020-21 season. If he sees out his full term, this will represent the 47-year-old's longest tenure at a club, following four years with Barcelona and three at Bayern Munich. City smashed Premier League records on their way to a dominant title triumph after picking up the EFL Cup this term, with Guardiola named League Managers Association and Premier League Manager of the Year this week in recognition of his achievements. But the celebrated Catalan tactician knows the criticisms of his trophy-less first year at the Etihad Stadium will return if City's youthful squad veer away from the standards set over the past nine months. "The contract and the manager always depends on the result. We have extended two years to stay for the next three years but we depend on results," Guardiola told his club's official website. "In football, what you have done in one year can change absolutely everything. But I have confidence with the club, with the chairman [Khaldoon Al Mubarak], with [director of football] Txiki [Begiristain]. We know [each other] perfectly. "When we feel things are not going well, we are going to change and I am going to make a step back. "I am trying, with all my efforts and desire to avoid that, and instead of making a step back we are going to make a step forward to maintain the level of this club. "We have a contract because we have to have a contract, but the club knows me and when I have the feeling that our relationship with the players is not good I am going to make a step back and another guy is going to come to help the players maintain this high level." It has been a startlingly high level – 100 points, 106 goals, 18 consecutive top-flight wins and a goal difference of +79 standing among the competition bests racked up by City this season. Guardiola has been granted a seemingly more favourable working environment in Manchester to realise this vision, free form the behind-the-scenes politicking at Barcelona and the over-arching influence of former players at Bayern. His relationships with chief executive Ferran Soriano and Begiristain, a former Barcelona team-mate, appear to have been key factors in City tying down the mastermind of their magnificent campaign. "I think I have a good relationship with the chairman," Guardiola added. "Ferran and Txiki, we have known each other for a long time – Txiki is almost part of our family. "We have all the conditions to be stable like a club and are trying to be ready for the next years. "I am focused on the pitch and the club has other important people working in other departments. We are going to try every day on the pitch to improve our players. "It is a young squad and if we are stable mentally - don't believe too much what we are and think about what we can do to improve our game - maybe we can compete with the rest of the teams in England and Europe."